It's time to play BASEBALL! And anyone who has an iPhone and is an ardent fan of their favorite Major League Baseball team, MLB.com At Bat 2009 [iTunes link] is a must have! This year, the big feature is Gameday Audio and I have to admit, it is impressive. I am a St. Louis Cardinals fan who lives in Honolulu, so games don't get televised a lot here. And while the video in "At Bat" is nice, it doesn't get posted fast enough to follow it live. Gameday Audio loads up VERY quickly and sounds very good, even on 3G. 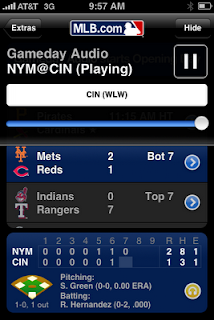 I can hear the audio of the game and watch every pitch be updated in "At Bat" just a few seconds later. It's a great experience. Take note NFL and NBA - THIS is how you do a great sports app. It's not cheap - it's $9.99. But, I bought "At Bat" last year for $7.99 and it wasn't available until July 11, 2008. So, I'm getting a much better deal this year. Most likely, this app will get a price decrease as the season goes along so if you're content for late-season or just a post-season app, you will probably be able to do so. But, if you're a BIG fan of baseball, you need this NOW.